November 6, 2015 – An UP Aerospace SpaceLoft rocket carrying several scientific and engineering experiments launched at 8:01 a.m. MST today from Spaceport America’s Vertical Launch Complex-1 on the East Campus. This is the first mission in which UP Aerospace demonstrated the capability to eject separate payloads that require independent re-entry into the atmosphere. Three separate parachutes provided soft landing of payload components. The SpaceLoft commercial research rocket was launched within the dedicated 2 1/2-hour launch window, and flight data indicate the rocket attained a maximum altitude of approximately 120.7 km/74.98 miles. The parachute recovery system brought the rocket and its payloads safely back. 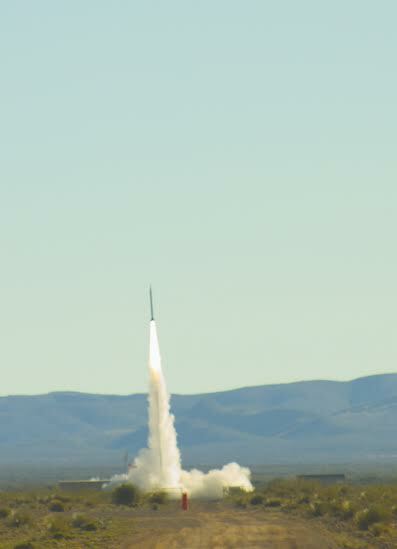 The payloads were recovered intact 49.62 km/30.83 miles downrange on the U.S. Army White Sands Missile Range as planned. This launch represents Spaceport America’s 24th overall launch and the fourth from Spaceport America with NASA Flight Opportunities Program payloads. Maraia Earth Return Capsule from NASA Johnson Space Center. This experiment tested a reentry capsule being developed to return small satellites and individual payloads from orbit on-demand. AVA from NASA Ames Research Center. This was a test of a developmental, low-cost avionics package, which will ultimately be used to monitor and control launcher systems designed for small satellites. Green Propellant experiment from Purdue University. This experiment studied surface tension behavior of a new “green” rocket propellant in low gravity. Results will be used to validate propellant management devices applicable to both geostationary and interplanetary spacecraft. SOF-2 from New Mexico State University. This experiment tested an autonomous, robotic method to identify unknown or changed inertia properties (mass, center of mass, moments of inertia) of a spacecraft. This will be used to enhance control capability of future on-orbit servicing missions such as satellite refueling, rescue, repair, and orbit debris removal. UP Aerospace, incorporated in 2004 by its founder Jerry Larson, is a space launch and flight test service provider specializing in advanced engineering, launch technology development, and state-of-the-art rapid and low-cost launch operations. The UP Aerospace SpaceLoft platform has reduced the cost and scheduled time to launch experiments and commercial payloads. UP Aerospace is headquartered in Denver, Colorado with launch facilities at Spaceport America, New Mexico.